Prior to the rise of the CN Tower and the TD Centre before it, the Royal York Hotel (completed 1929) was the most prominent building on Toronto's skyline. In fact, up until rather recently, it was still a key figure despite years of development around it. No more. With condos and business towers popping up at what seems to be breakneck speed, the Royal York has finally been almost completely obstructed by other buildings. Perhaps this is not an occasion for mourning -- cities do, after all, have to grow and the area in question was ripe for development -- but I can't help but feel a tad disappointed that a series of glass buildings -- as nice and as environmentally friendly as they are -- has enveloped this landmark on the skyline. Truth be told, condo development along the waterfront (i.e. Queens Quay) had already got this process started long ago. But, depending on one's angle, the Royal York could still easily be picked out from the line up of surrounding buildings up until recently. This was particularly the case from a position of height, which the above photograph (shot in March 2007)) demonstrates. 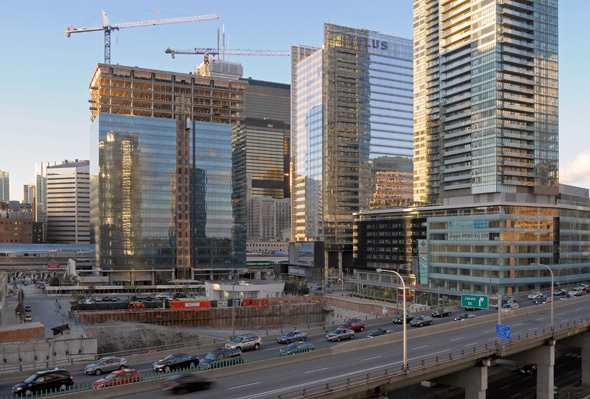 Taken from a public parking garage on Queen's Quay -- a favourite location to shoot for Toronto photographers -- both the hotel and Union Station remain highly visible amongst the mix of structures. 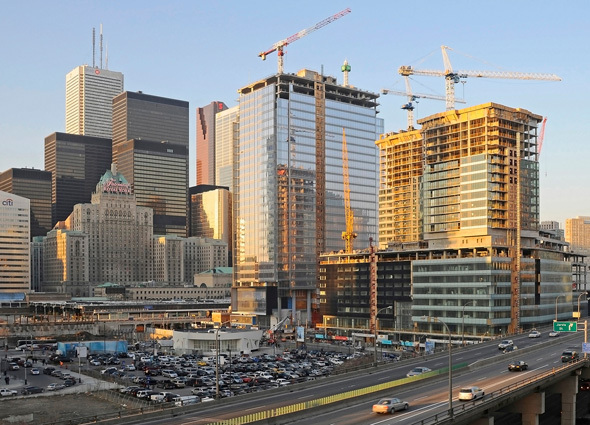 By May of 2009 (above), construction on the Telus Tower and Maple Leaf Square is well underway, though the view of the Royal York is yet to be encumbered. Fast forward to yesterday afternoon, and this is what this portion of the skyline looks like (below). The angles aren't identical, but they're pretty close. It's quite the transformation, yet doesn't the city now look rather anonymous? And, from this angle at least, it's not just the Royal York that's blocked off. 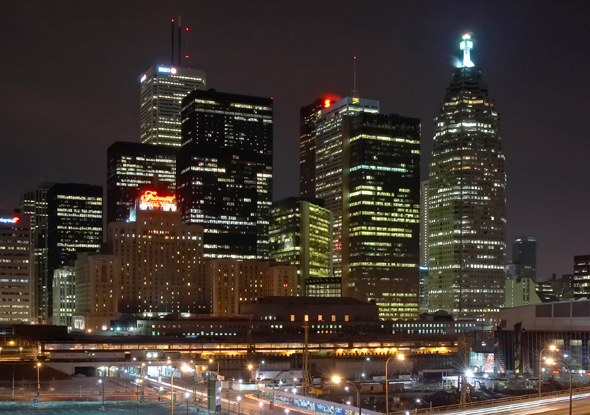 A number of the iconographic office towers of the financial district -- including First Canadian Place and Scotia Plaza -- are more or less struck from one's sight line. Is change like this bad? Should we preserve such abstract things as views (it's not as if the building has been demolished)? Not necessarily. But just as change may not be bad, it's not necessarily good either. It'd be easy to say that "it just is" -- i.e. neither good nor bad -- but the reality is that our emotional connection with the city of the past often underwrites a nostalgic response to its transformation. 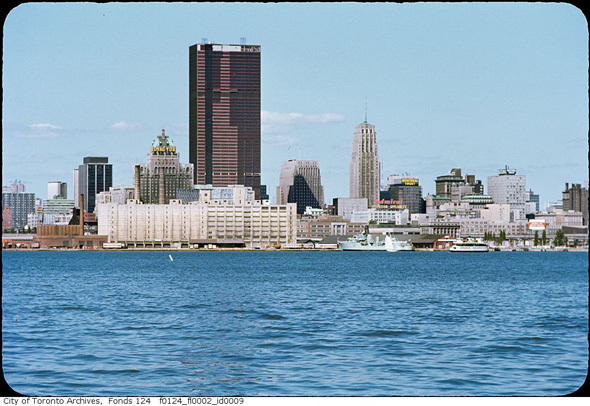 So, with that in mind, I'll mourn this loss for a little while before inevitably adopting a newer version of Toronto, one which will surely inspire nostalgia in its own right.